March is the month of surprise snow storms, excessive Irish drinking, and some time to check out some magnificent books. If you’re pondering what your next great read will be, have no fear. We Voices keep up-to-date with both classics and the newest releases in the book world. Toni Morrison was the divine mind behind Beloved, the beautifully creepy story about a family and their life after abolished slavery, chronicling the experiences of a black woman named Sethe. Beloved focused on not just her days as a slave and her time living as a free woman, but also the mental trauma that she endured. Morrison infused Beloved with the heavy theme of infanticide, representing the true historical actions of many slave women. Morrison was also the writer behind many other great books like The Bluest Eye and Paradise, and in February 2019, she came out with a brand new book, The Source of Self-Regard. As a collection of essays, speeches, and meditations, she evaluates social issues with keen awareness as well as giving insight to her work as a creator and artist. If you’re interested in some deep reading to get you through the chaotic snow drifts of March, I strongly recommend giving Morrison a look. Check out Penguin Random House for Morrison’s new book. A possibly biased opinion, but Shirley Jackson was the foundation of modern Gothic literature. With her creepy inspiration, she published a massive collection of short stories along with five novels in her lifetime. Her most popular novels were The Haunting of Hill House and We Have Always Lived in the Castle, but The Sundial was one of the most deviously clever novels. What set this book apart from others was the thoroughly unlikeable cast of characters living in a grand house, driven mad with paranoia and potential prophecies of end times. Jackson appreciated fine architecture. Her work is full of grand mansions that are overwhelming in physical details and personal histories. The Sundial revolved around the large mansion of the family, and turned into their prison as they began to fear the world ending, due to a supposed ghostly apparition claiming that the family would inherit the Earth in a year’s time. Fearful of destruction, panic from the real world Cold War infused itself into the plot. The family retreats into this mansion like a bunker, preparing for world’s catastrophic events. They begin to burn their possessions to make room for necessities like first aid kits and rations, and slowly descend into madness. Winter might seem like the end of the world, but you can at least take comfort in Jackson’s delightful dialogue and dramatic plot lines. Ready to dive into Jackson’s brilliant novel written in 1958? Check out Penguin Books UK for this great read. I always appreciate a fantastic debut novel, especially when it is so masterfully creepy. Telling the story about a woman obsessed with her famous neighbour, Laura Sims describes a delicate boundary between admiration and obsession with a master touch. Living just houses away, there is no privacy to be found in this story. The narrator obsessed over not just the woman but her garbage and looks, adopting similar lipstick and clothing to become the woman. The theme of stalking in literature has become immensely popular due to the Lifetime-turned-Netflix series You, and we have become much more aware of the privacy concerns. We’ve possibly all tried to cyber stalk an ex-partner online, or have been stalked by others, and we have grown startling used to cat-fishing. Looker is a new spin on the issue because it removes romantic obsession from the story, and infuses the desire for friendship and basic relationships. Friendship is often an undervalued theme in literature, and Looker revealed the danger that can exist between two different people, without the inclusion of a sexual element. An excellent contribution to the thriller genre, Sims manages to include jealousy and real world infertility struggles into her work. We should all be keenly anticipating her next novel. Are you ready for an intense, razorsharp read? Check out Simon & Schuster for this brilliant novel. Famous for her poetry, Maggie Nelson draws inspiration from real events that impacted her own family when her Aunt Jane Mixer went missing and was found murdered in the 60s. Her work The Red Parts had been written after her collection of poetry based on Jane, titled effectively as Jane. The poetry shed insight of true crime and the issues of inherited grief, and contained enough research that it became heavily valuable to detectives who picked up the case. She was communicating frequently with the lead detective, sharing her personal research and providing careful insight to certain elements of the case. Due to limited resources at the time, Mixer had been a cold case before DNA had grown highly useful. With new technology and options available, her case was reopened and connected to two different DNA sources, allowing justice to be legally given. The Red Parts is a personal examination on the experiences on living exposed. Mixer had originally been suspected to have been a victim of the Michigan Murders, but elements of her case had separated her from other bodies. Because of the mystery behind her disappearance and reappearance in a graveyard, her family suffered trauma and confusion. Death becomes more terrifying when a sister and daughter are found strangled on top of a grave, with her possessions pooled around her. Nelson cleverly gave testimony as a stranger to her dead Aunt, but it shows how deeply Mixer’s murder impacted her own life, and her relationships with her family. An excellent nonfiction look into the corners of the true crime world, Nelson weaves poetic language into her prose. Need some true crime in your frigid life? Head over to Penguin Books UK and jump into Nelson’s brilliant prose. Recently widowed Elise is sent to her husband’s country estate, and is tossed into a Gothic landscape filled with unsettling wooden figures that slowly multiply over the course of the book. Carrying on in the same vein of other excellent books like The Haunting of Hill House and Rebecca, this book is highly recommended to readers who love the feeling of anxiety twisting in their stomachs. She’s recently released a new novel in the past year, and I highly recommend browsing through her work. She establishes historical scenery and fixates on proper representation of women as both victims and villains. Modern (and successful) takes on the Gothic genre are incredibly rare, but Laura Purcell managed to successfully transform the element by including brand new material like wooden mannequin dolls. With a dead cow left on the doorstep of the country estate and unreliable narrators, this is a brilliant read that you will fly through. You’ll be pondering over the true villain for days afterwards. Creepy gothic atmosphere with shades of Jackson? Hit up Penguin Random House. Is anything more haunting than a postwar mansion slowly crumbling away? 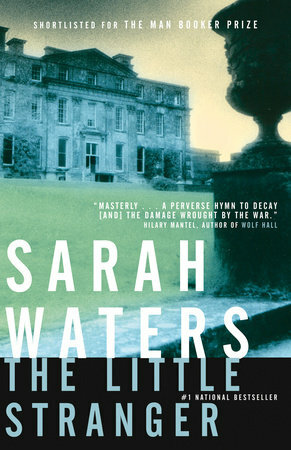 Sarah Waters spins a haunting tale about the Hundreds Hall, a once impressive and massive estate that is now falling to pieces. The garden is overwhelmed with weeds and the house is becoming a challenge to maintain with limited income by the Lady of the house and her two grown children. Doctor Faraday becomes quite close to the family of Hundred Hall, and begins to pry apart the ghostly secrets within the walls. This book is definitely the opposite of a classic ghost story. Waters uses this novel to reveal the historical downfall of the entire class system post war, with the infusion of a possible ghost running around. With delightful atmosphere and lengthy dialogue sections, this book is fairly lengthy, but a perfect read to get you through the month of March. If you are a fan of Agatha Christie’s The Murder of Roger Ackroyd, you will adore the tense and unreliable narration, and the vivid characters springing to life across the pages. Waters has written many great novels that focus on different areas of history, but this is one of her most vividly researched pieces. You can find all of the creepy ghostly themes by Sarah Waters at Penguin Random House Canada. Don’t be a victim during the final stretch of winter’s cold, icy grip. Set yourself up with either some fictional tales of ghosts or brilliantly written accounts of true crime, and find yourself a comfortable place to hermit. Any books catch your attention lately? Let me know @rahel_taller.